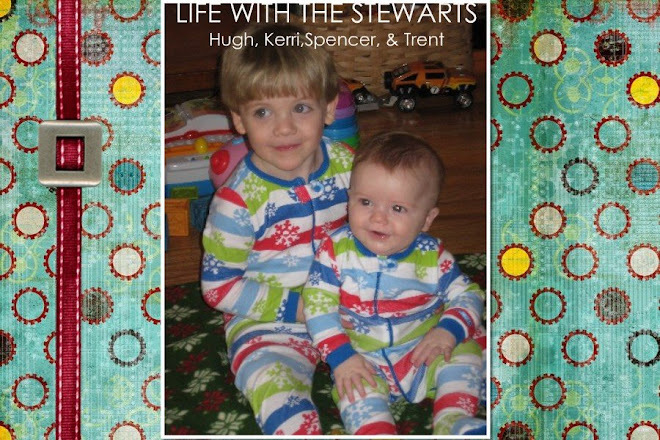 Life with the Stewarts: Finally...a moment to catch up!! Trent came home from the hospital on June 19th. He was eating well and doing great. When we left the hospital he weighed 7 lbs. 4 oz. Having him home was so different for us because we were nervous wrecks when Spencer came home. It was such a blessing to have a healthy baby who didn't come home with a monitor attached to his belly. We took him to get his weight checked when he was two weeks old. He had already gained 1 lb and 3 oz. He is a little pig! He has his days and nights mixed up. He sleeps most of the day and some of the night. At 12 days old, Trent went on his first outing with Mommy and Daddy to Walmart. Ha! Cabin fever had set in after 2 months of bed rest and a week in the hospital. I had to get out of the house!! Trent loves to hear our voices, especially Spencer's voice. Spencer is getting used to his baby brother. He is still having trouble sharing our attention. It never fails that when I am feeding Trent Spencer decides to climb up the walls (or try to tear them down)! You've gotta love a two year old. This month things were a little easier for the most part. Trent is sleeping much better now. Usually, he takes 3 long naps during the day for 2 hours or so. At night, he will sleep for up to 4 1/2 hours at a time. He loves to be held and hates to be put down in his bed. Don't most infants do the same thing?? Trent loves to be outside like his big brother, loves to hear Mommy sing, and he is trying to coo at us. It has been a month of firsts for Trent. He took his first trip to the lake at 2 weeks old. (Again, I had to get out of the house.) He sat under the umbrella and watched Spencer & Daddy swim with Mama & Papa. He went to church and to the mall with us at 3 weeks old. I ventured to the grocery store with both boys. I had to call my dad to come and help me. I couldn't handle them both. Pitiful, I know. Hugh and I celebrated our 5 year anniversary on July 19th. We went to dinner and to shop for a ring for me with Trent's birthstone. Spencer stayed with my parents and Trent stayed with Hugh's parents. This was his first time to stay away from us. I actually did alright. It was nice to spend an evening alone with Hugh. They are rare! Trent had his one month check-up on the 16th. He weighed 10 lbs. 7 oz. & had grown 2 1/2 inches. Dr. Harmon said he was doing great. He couldn't believe how much he had gained since birth~ 2 lbs. 12 oz.!!! His umbilical cord finally fell off at 6 weeks. We could finally give him a tub bath. He liked his bath, except for getting his hair washed. We got our first real smile from him on July 31st. He was 6 weeks old. It is so fun to see his cute little grin. Spencer is getting so big! He is talking non-stop now. It amazes me the things he says and especially what he understands. He loves to sing songs and play with trucks and cars. I think we have a record for the number of Matchbox cars one can own. Ha! He loves to play outside and ride the lawnmower with his Daddy. He learned how to peddle his tricycle this month. Hugh worked with him and taught him how to do it. I missed seeing him for the first time, but have seen it many, many times since then! Trent started cooing at us on August 1st. He had been trying to figure it out for a week or so. Now, he won't stop! He loves to kick his feet and move his arms when he's awake. Spencer thinks this is too funny. We told him to say "Ah-goo" to Trent and see if Trent would talk to him. He did, and I think they talked for 2 minutes straight "Ah-gooing" at each other. Hugh and I watched on and laughed hysterically. Trent amazed us at 8 weeks old and slept for 7 hours straight. Spencer didn't sleep through the night until 5 months old. Since then he has been going between 5-7 hours each night between feedings. I feel like a new woman!! He went for his 2 month check-up and is growing so fast. He weighed 12 lbs. and 10 oz. and was 23 inches long. He has gained almost 5 pounds since birth and grown 4 inches. I want to stop time and enjoy him being little for a while longer. It amazes me how fast they grow up. Well, I think that covers the last few months of our lives. It's crazy how much the boys consume our lives. But, I wouldn't have it any other way. Such sweet pictures. I already miss those early months! Enjoy your babies!